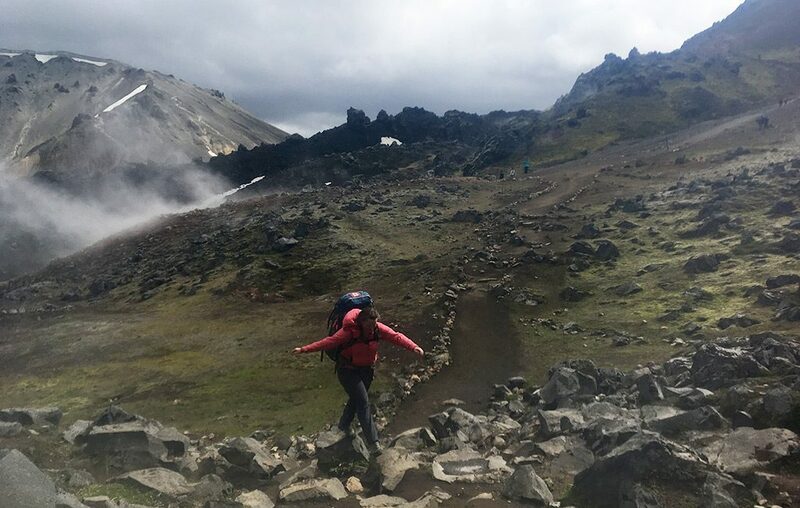 4 days, over 55 kilometers, 3 friends, and Mother Nature: the Laugavegur trail. These four things sadly didn’t go together as planned. Did we finish the trail? No. Did we learn a lot about respecting our limits, comfort zones, each other, and Mother Nature? Yes, we most certainly did. 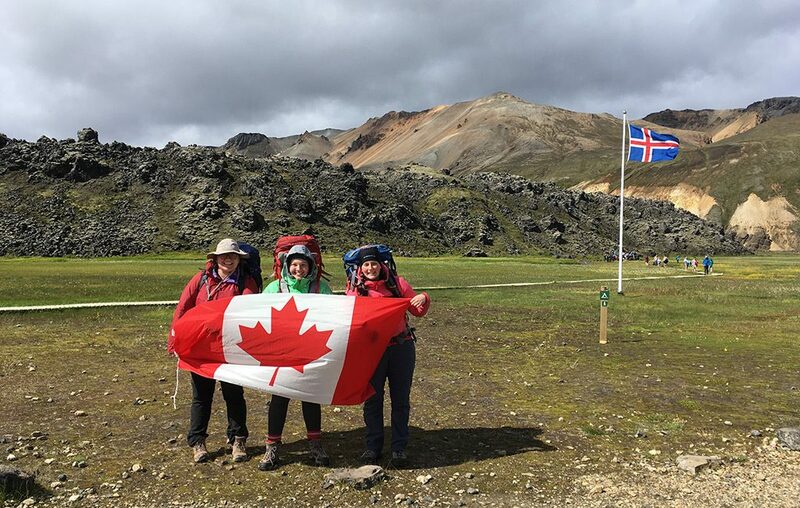 Several months before travelling to Iceland, two friends and I planned to spend some time together in the country before the 15th World Rover Moot began on July 25, 2017. We went through a variety of options for our 5 days together, but after a coworker told me that the Laugavegur trail was his favourite hike of all time, I was sold. I quickly told my friends about it and our Scouting spirit gave us an uncanny and unwavering excitement for this adventure. The hike travels for 55 kilometres from Landmannalaugar to Thorsmork in the highlands of Iceland, and is the most popular hiking trail in the country. I knew there were many risks we had to consider for this hike and I planned for all of them. I was ready for medical emergencies with a well-stocked first aid kit, we had over packed on food in case we got set back due to a storm or exhaustion, we brought extra fuel, had a satellite communication device, several maps, compasses and a trail guidebook. Despite being told we didn’t need them, we even had water treatment tablets. We spoke about the days it would take us and if we had the right gear. In our preparation we made sure to understand how far we would be travelling each day, and had talked about the potential for needing back up plans; we were prepared. Nothing could have prepared us for what Mother Nature would throw at us. Despite our thorough preparations: upon arriving at Landmannalaugar, we immediately noticed the wind. We made ourselves lunch, took some pre-hike photos and started our journey. Within steps of the trail, the scenery amazed us: volcanic rock fields, patches of snow, crystal clear ponds, and views as far as the eye could see. The smell of sulfur coming from geothermal pools of boiling mud, the layers of rock and soil that looked like so many beautiful shades of earth tones… All of us were absolutely blown away at the scenery. Fast forward to two hours or so later: we were blown away, more literally at this point. I have tried many times to find statistics on the wind speeds where we were that day but I have been unsuccessful. Allow me to attempt to describe what we were experiencing: one from our crew used my hiking poles to steady herself, I was leaning towards the wind just to counter how much it was pushing me the other way. Our pants were whipping in the wind and anything that wasn’t securely attached to our bags or bodies was being ripped off at the smallest change of wind direction. One group member in another crew lost their bag cover and the wind was so deafening no one even heard it disappear! We were only walking maybe a meter apart from each other, but we had to yell to be heard over the howling of the wind. Eventually we stopped along a sort of ridge: there were no trees or rocks or any barriers which made the wind numbingly loud. We checked the map, hoping to see that we were getting close to the campsite for the night. At this point, we also realized that between the two maps they showed different trails, one that showed us to be very close to our destination, and the other another 2 hours out. We recognized that we had to make sure we were all ready to either go ahead together or decide a different course of action. In the end, we all agreed that the wind was very unnerving and dangerous as it could throw us to the ground any minute. We discussed our options: we could go on, uncertain of being able to get to sleep or even set up camp properly in such high winds — we didn’t have experience with this. Or the other option was to turn back to the campsite where we had lunch. We knew the services that were available there and that there was protection from the wind if needed. Going forward meant we didn’t know how long we had until the site and we concluded that without feeling one hundred percent comfortable with the current weather or where we were on the map, we should not continue on. To me, this meant that we were giving up — I felt heartbroken that were not going to accomplish this trail. Rationally, I knew it was the right choice to make: we weren’t in a safe position, and we had to remain a team in this decision. This meant we had to focus on the most conservative and safest outcome. I had imagined every step of this trail, had felt the accomplishment of finishing this hike, had become emotionally invested in completing this journey and sharing the experience with people when I got home. That side of me was devastated. I felt a very powerful sense of sadness for being incapable, with Mother Nature for being so unpredictable, with my friends for not wanting to risk themselves more, and with myself for getting myself so hyped up on this hike. It has taken me over 6 months to get this article written: I kept finding myself getting distracted and quite upset in trying to write it. This trail, and hike was more than just an adventure, it was a goal I had hoped to achieve. The emotion that surprised me the most was the resentment I felt towards myself for not just going into the wind and risking it. I found this one particularly hard to process since I am a very safety conscious person. I knew when I started feeling the wind how much this could impact our safety, but I never expected that my sense of confidence and accomplishment would be so damaged. Looking back on it now, we made the right call; it was not safe to continue. I am proud that we made this choice, and that we made it together, but it was a tough situation. As someone who is used to being in charge, I was not prepared to let Mother Nature make the final call on accomplishing this hike, but she did. And she will continue to be the main factor in deciding the safest adventures.